Introducing the Cromar Leadax- Second Generation Lead Alternative Sealant from Cromar, brought to you by the trusted specialists at JJ Roofing. When you’re searching for premium-quality roofing products, tools and materials, you won’t find a better selection than right here. The Cromar Leadax- Second Generation Lead Alternative Sealant is no exception and is sure to provide first-class results regardless of the complexity of your roofing project. Cromar Leadax- Second Generation Lead Alternative Sealant is an all-purpose material designed to affix Leadax to the base material for overlapping. It has been specially designed for use with lead-alternatives such as Leadax, so you can rest assured that all aspects of your roofing system will be free of lead. 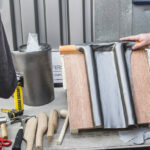 As a company, Leadax are committed to providing high-quality lead-alternative products that boast all the benefits of traditional lead without the unfortunate drawbacks. Their products are environmentally friendly and will not impact a person’s health making them a safer alternative. The Cromar Leadax- Second Generation Lead Alternative Sealant has been designed to be equally safe to use without compromising on its performance. The sealant is easy to use and can be applied by novices and professionals alike with no mess or fuss. You’ll be producing professional results that will ensure a long and productive service life for the roofing system in question. So, what are you waiting for? If you’re searching for a quality sealant to add the finishing touch to a lead roofing system, look no further than Cromar Leadax- Second Generation Lead Alternative Sealant.